This is the fifth in a series of articles giving brief biographical sketches of the people who owned the Wanstead estate over 800 years. Links are given to sources of additional information on this site and elsewhere. Lord Mountjoy, owner of Wanstead Park from 1598, was a kinsman, probably a cousin, of Christopher Blount, from whom he had purchased it. Later promoted in the Peerage (1603) as Earl of Devonshire, he is best known as a soldier. He successfully concluded the Nine Years War in Ireland using the most ruthless methods. 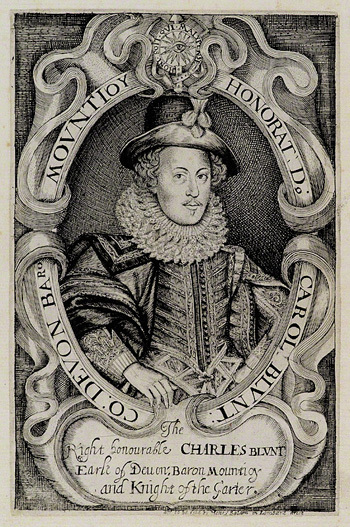 In 1601 Mountjoy was implicated in the Earl of Essex’s attempted coup d'état against Elizabeth's government, and was fortunate to escape punishment. Essex himself, however, was condemned and executed along with his step-father, Sir Christopher Blount, and others. A favourite of Elizabeth who fell from grace, Essex had been an ambitious soldier. However, his lacklustre performance during the conflict in Ireland, and accusations of entering into a "dishonourable treaty" with Hugh O’Neill, Earl of Tyrone, led to the loss of his command and brief imprisonment. Injured pride and mounting financial problems then led Essex into treasonable courses and an absurd, hopeless uprising. In June 1604, Lord Mountjoy brought the now defeated Earl of Tyrone to Wanstead to await the new King's order to appear at court and make his submission. This was not Tyrone’s first visit: in happier times, a quarter of a century earlier, Tyrone had been one of those who witnessed the pageants at Wanstead House when Leicester entertained Queen Elizabeth. As a young man, Tyrone had enjoyed Royal favour: he had spent his early life as a fugitive under English protection, and was believed well-disposed to the English interest in Ireland. However, once established as Chieftain of the O’Neills and paramount lord in Ulster, he had found the Crown’s increasing assertiveness in Ireland intolerable, and begun the fateful rebellion which ended in Ireland’s effective subjugation for the first time in four centuries. Lord Mountjoy’s private life took an unorthodox turn in about 1590, when he began a liaison with Penelope Devereux, the Countess of Leicester’s daughter. Regarded in her youth as a great beauty, she had been married against her will in 1581 to Robert, 3rd Lord Rich, by whom she had several children. Though reputedly “a man of violent and coarse temper”, Rich tolerated the situation until Penelope’s powerful brother, Lord Essex, was executed in 1601. He then seized the opportunity to cast her out, along with her last three children, all of whom had been fathered by Mountjoy. From that point, Penelope and Mountjoy lived together “in flagrant adultery”, and Rich ultimately divorced her in 1605. Curiously, what brought about the couple’s exclusion from Court was not their very public relationship, now of ten years standing, but the unlicensed marriage ceremony they went through at Wanstead House later the same year. Carried out by Mountjoy’s chaplain, William Laud (later a famous, and unfortunate, Archbishop of Canterbury), it was of dubious validity under canon law, and incensed the King. However, within a year Mountjoy was dead, and Penelope followed him to the grave in 1607.